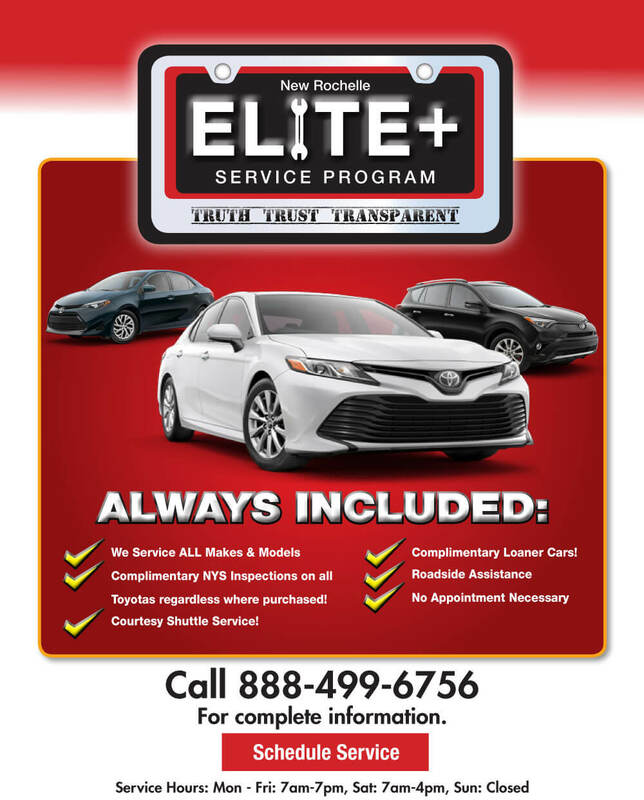 Whether you reside in New Rochelle, NY or surrounding areas, you can trust New Rochelle Toyota as your source for all of your automotive support and services. At our full-service Toyota dealership, we employ a highly-educated, trained and experienced team of certified technicians who can perform numerous automotive services on all vehicles of all makes. From oil changes, tire rotations and wheel alignments to complete replacements or repairs, our mechanical specialists can do it all - and do it well. Our team of technicians also performs these wide-ranging services equipped with genuine OEM parts that are meant to fit within your vehicle and work fluidly with other internal components. For ideal operation and function, using factory parts is necessary. The team here at our dealership near Yonkers, NY will also carry out the services your vehicle needs according to protocols directly from its manufacturer. We provide our customers with by-the-book, professional service that will keep vehicles running at their peak conditions for the long haul. So when you’re ready to enjoy the exceptional service you deserve for your vehicle and get back to the road as quickly and efficiently as possible, don’t hesitate to schedule your service with us! If you’d like to learn more about our Elite+ Service Program, feel at ease reaching out to us directly by calling 888-499-6756 or sending us a message! We look forward to supporting you in keeping your vehicle healthy!